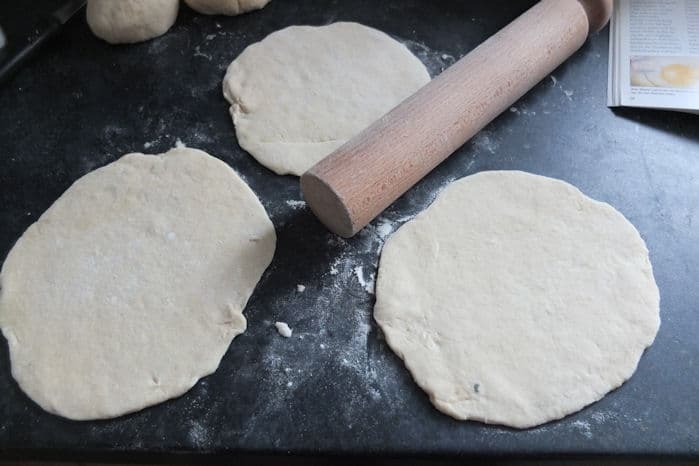 I always wanted to make homemade pita bread. But to be honest I was a little scared. How do those holes get into the pita bread? It’s actually quite easy. Since I taken this photo of my first attempt I have made it twice. I now even eat it with Peanut Butter for breakfast! 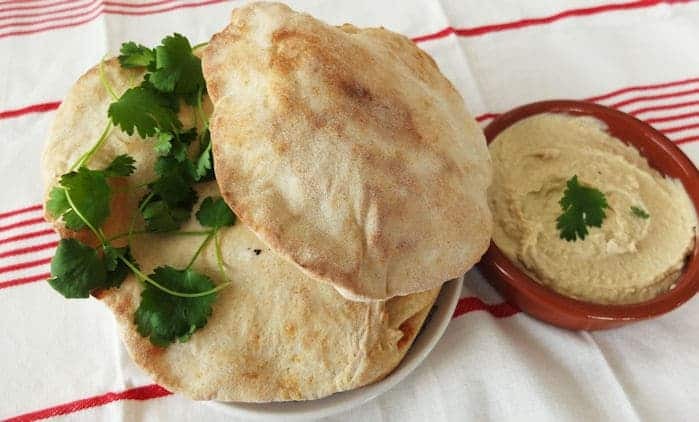 Pita bread is the ideal dish to go with any Lebanese Recipe that you can find on this blog. I felt that in my mission to master the world of Lebanese Cuisine I simply had to give it a try. And I am glad I did. Thankfully I came across the great pita recipe from my Lebanese Cookbook Compoir Libanais. They gave me three tips. The key to a successful pita baking experience is a very hot oven, and a very hot iron baking tray. Also if the pita fails to rise it is probably because the dough is not moist enough. I served it with a Lebanese Lime and Mint Chicken Dish and some Hummus. Divine! Pour all the water into a mixing bowl and stir in the yeast until dissolved. Mix everything firmly and add a little water if you find the dough too dry. Cover the bowl with a wet towel and leave to stand for 30- 60 minutes to rise in a warm and dry place. Preheat the over to 240 degrees, and place an iron baking tray in the oven to heat it up. 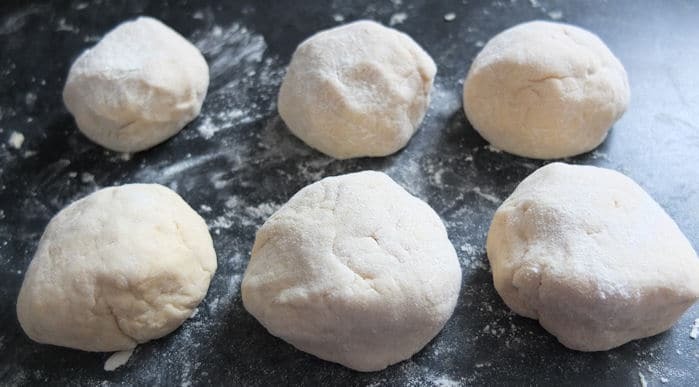 Divide the dough into 10 equal pieces and shape them into balls. Place in a tray and cover with a towel and leave them for about 15 minutes. Now roll them out to rounds or ovals about 5 mm thick. Remove from the tray and cool on a wire racket or basket. Tip: If the first ones did not puff up enough spray the remaining dough with a little water. 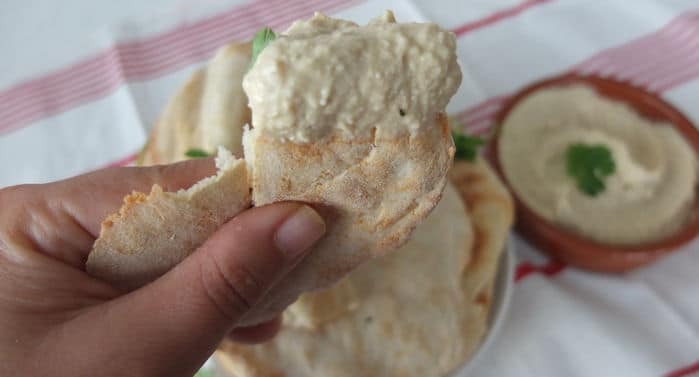 6 Responses to "How to make Pita Bread – a Lebanese Pita Recipe"
Thanks Jen! I hope to share some German bread with you as well at some point. My father actually comes from a baker’s family so I must have it in my blood.